This week is Easter. It is a tough time for all who are trying to lose weight and/or trying to be healthy. Why not set a new tradition to swap healthier gifts for Easter, because in-fact the holiday is not actually about chocolate, it’s about Jesus. So for someone like me who doesn’t want that horrible sweet crappy chocolate or Jesus, I have chosen to bake some hot cross bun inspired oatmeal cookies. 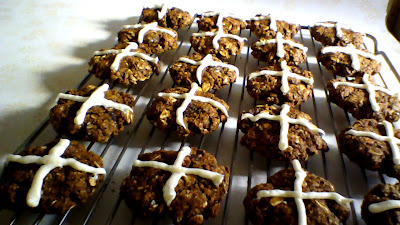 I added some mixed spices to make them taste more like hot cross buns and substituted half the honey (1/4 cup – 2 Tbsp) with blackstrap molasses which you can get from the health 2000 store. Here are a couple of links to some healthy Easter recipes that you may be able to use and share instead of a ton of chocolate! Remember it’s all about balance, if you do receive chocolate there are some options…re-gift to one of those bastards who can eat anything and never put on weight or control your portions; look at the serving sizes and control yourself. Put the stuff out of sight and when you do go to eat some, first drink a huge glass of water or enjoy some herbal tea (peppermint aids digestion and green tea boosts metabolism), wait at least 10 minutes, and if you still want that chocolate then have a serving size and savor it! · Dark chocolate raspberry M&Ms from the English food store on Riccarton Road. · Salt and Vinegar almonds from Pak’n save Riccarton – cancels out cravings for salt and vinegar chips, adds healthy fats, protein and vitamins to your diet. However, watch your portions as these are moreish. They are high in sodium so try to have no more than 10-15max a day. This makes me want to go home and bake, I'll be honest! I find it kind of funny in a way that people haven't figured out I don't really eat that kind of food anymore; but what I find even funnier is the reaction I often get when I give it away. I mean seriously; I understand that re-gifting is frowned upon by a lot of people; but the idea of eating something you didn't want to "just to be polite"? Or worse, taking it home and throwing it out just so the person who gave it to you wouldn't know about it? Insanity.